Inter Milan have confirmed that right-back Javier Zanetti will retire from playing at the end of the season. The 40-year-old is Inter's record appearance maker, having played 862 times for them since his 1995 move from Banfield in his native Argentina. He is Argentina's most capped player, with his 145th cap coming in 2011. Zanetti, who won five Serie A titles and the 2010 Champions League as part of a treble under Jose Mourinho, will become the club's sporting director. He could make his final San Siro appearance against Lazio on Saturday, with a potential career finale at Chievo Verona on Sunday, 18 May. However, coach Walter Mazzarri says the veteran is not guaranteed to get a farewell match. "Will Zanetti play? You'll see who I pick tomorrow," he said. "I speak to him on a daily basis, he knows that my choices are always logical and made based on beating the opposition. "Either way, Zanetti is an Inter legend, it's weird to think we'll no longer see him out there playing or training, he's emblematic of this club. "It's emotional when such an important footballer retires, not just for the fans either." 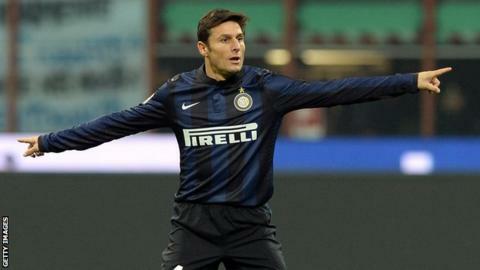 Zanetti said: "It was a dream to come to Italy. I thank Inter and the Moratti family for believing in me when I was unknown. "Defending Inter's and Argentina's colours while wearing the captain's armband has been a priceless experience."